Perhaps fellow members commiserating at someone's ineptitude to grasp the obvious ? Who are these idiots in the GIF image? 5. Exit and goof no more. Any way to cajole it back into its former well-behaved, functional self ? @smaragdus: I checked and it looks like the download.com link has been updated. I tried checking it through the "about" menu but the program doesn't give a specific version number. 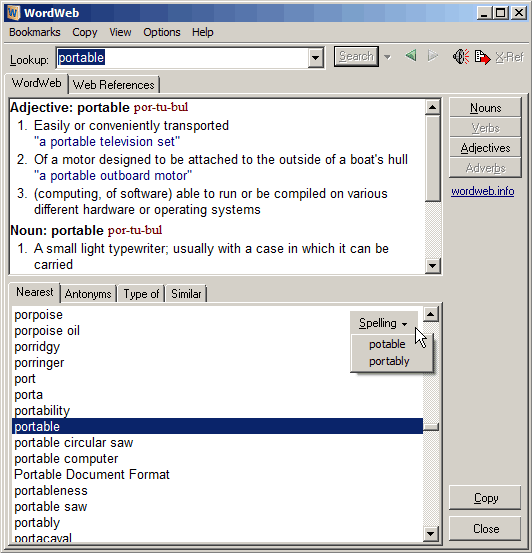 WordWeb web-site offers download via Download.com (no direct downloads) and the version downloaded from Download.com (as of 2016.08.13) is 8.02. The new flat tool-bar icons are abominable- back to version 7.2.
and download the current version (6.71). That version installed itself in my Portable Apps manager without any problems. I have used both the paid and free versions for many years and really love this program, but have never experienced any of the questions regarding my travel plans. @stwum: I've switched the download link to point to MajorGeeks. I had wordweb myself for several months, until one day I opened it and there was a dialog box asking me about my travel plans (as apparently is in the licensing agreement). I gave the 'wrong answer' and the program stopped letting me run it. I uninstalled it. Could someone please explain to someone else who has never set eyes on the license agreement, what it is? What's that about a "return trip in 12 months?" Lawdy, I hope it doesn't mean I could only use the thing once a year for free. What is "innovative and intelligent" about the license agreement? Is this freeware or isn't it? The license is innovative and intelligent! I really appreciated such an initiative. We all are traveling in the same boat called Earth, and we all must develop a serious commitment to our own benefit. Kudos for the intelligence behind the license agreement! Snidely - Thanks, good to know! It's a great piece of software.... Especially at this price! My understanding of the licensing agreement is that it's based on the honor system. It doesn't "stop after a year", or thirty days, or ever. The author states that "you must uninstall the program" after thirty days if you don't meet the qualifications. The licensing terms that Transcontinental referred to applied to WordWeb 5.x, but seem to apply to the latest version as well. Anybody know where I can get a copy of the version 5 that commenter Transcontinental mentions? "Free for people who do not take more than one return flight in any 12 month period"
I'm sticking with version 5.0, which doesn't stop after a year. This is fake frewware.